Dining when you live alone (or sometimes just eat alone… think dorm or an apartment with roomies) can sometimes be boring! 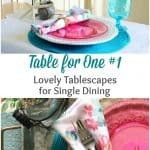 Well, I’m here to say that you can elevate your dining experience with a little help from Table for One Lovely Tablescapes for Single Dining! Hey all! Are you ready for the weekend! I sure am! I left work just a wee bit early today, as I was feeling a bit ‘meh’. Came home and took a little nap, and I feel better. 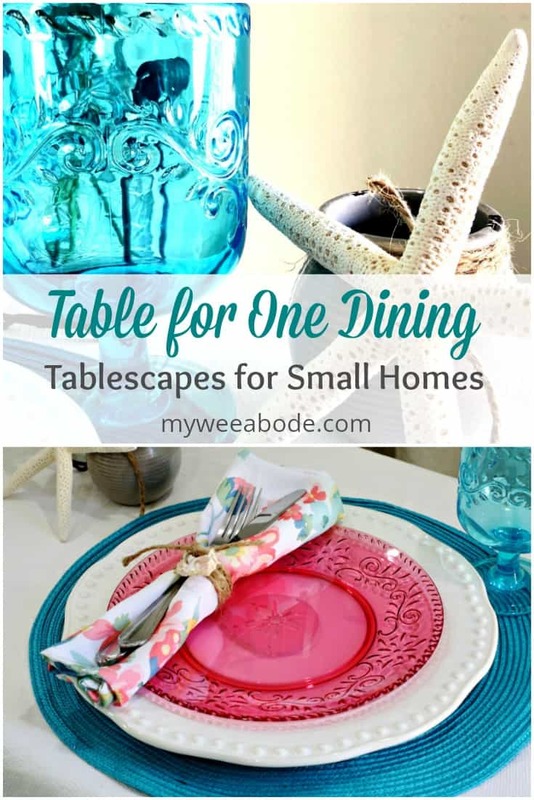 Better enough to introduce to you the first installation of a new series here at My Wee Abode: Table for One, Lovely Tablescapes for Single Dining! 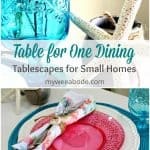 I received so many ‘likes’ and comments on the Instagram photo, I decided that regularly sharing a “Table for One” might just be the ticket for those of us who live alone, or even in a home where room-mates don’t always eat together. 😉 So, let’s get to it, shall we? I love the light and airy feeling this table setting has. When dining during the summer, I like to make things simple (okay, who am I kidding, I ALWAYS like to make things simple). “Simple” works great for me being in a small home, too! Take a look at my very first post Pros and Cons of Living in a Small Home for more about small-home-living. I just love that pink sand dollar plate on the ivory-colored ‘charger’. So summery (I’m making it a word) and coastal! And I think the details on the two plates complement each other perfectly! I wanted to add some dimension and interest to the table setting so I added this pretty floral napkin. I like using cloth napkins, as they are economical AND lovely! Wrapping the napkin in twine and tying a little shell to it was super easy, and, again, gave a nod to the coastal summery vibe! Love the detail on the goblet! Now for the fun stuff! Shopping!!! (okay… MORE fun stuff!) 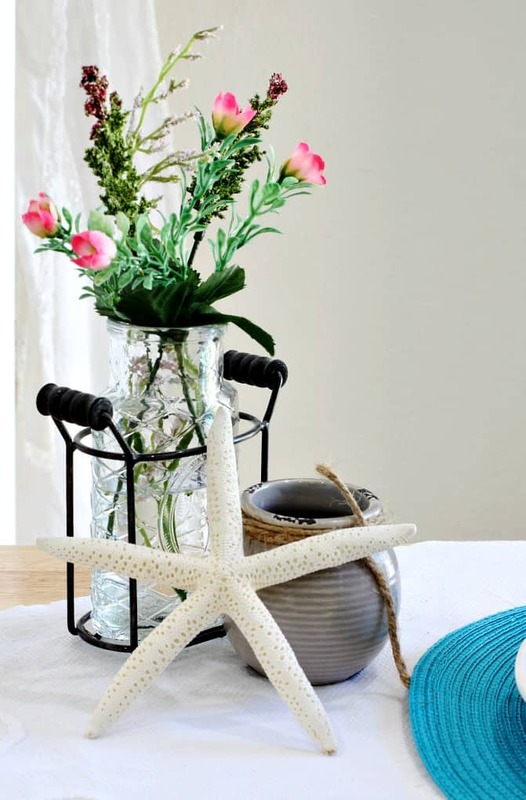 Sand Dollar Lane subscription box offers a curated collection of coastal farmhouse home décor with a different theme every month. Each box contains 4-6 full size home decor items worth an average of $75-95! 2 silicone ice cube trays (palm tree and flamingos). Isn’t it sweet?! It’s hard to tell here, but it has the same scroll-y detail as the goblets. 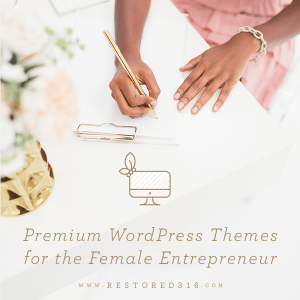 The August subscription box theme is “Light and Breezy”… you can get a sneak peek HERE. 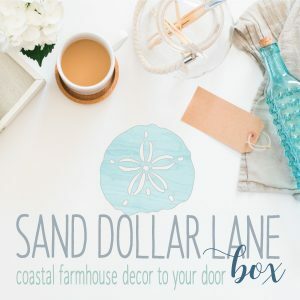 To get your first Sand Dollar Lane subscription box, simply click on my affiliate link HERE, or on the Sand Dollar Lane photo in the sidebar. Want 10% off???? Use the code ‘myweeabode10’ at checkout! So, what do you think about this first Table for One tablescape post? I’m totally learning as I go along, so would love to hear what your thoughts are! What should I include next time? What did I miss this time? Let’s chat in the comments! So fun and I love that floral napkin. It ties all your summery pieces together. Thanks, Patti… I knew what type of napkin I wanted, and was able to find it at HomeGoods! Always love when that happens, right? 😉 Have a great weekend, friend! Hugs! I love this Julie. A creative idea that can be used by many. Thanks, Marissa… I think the Sand Dollar Box for August is going to be just lovely! The pillow they are offering is SO pretty! Thanks for all your encouragement and help, dear-heart! 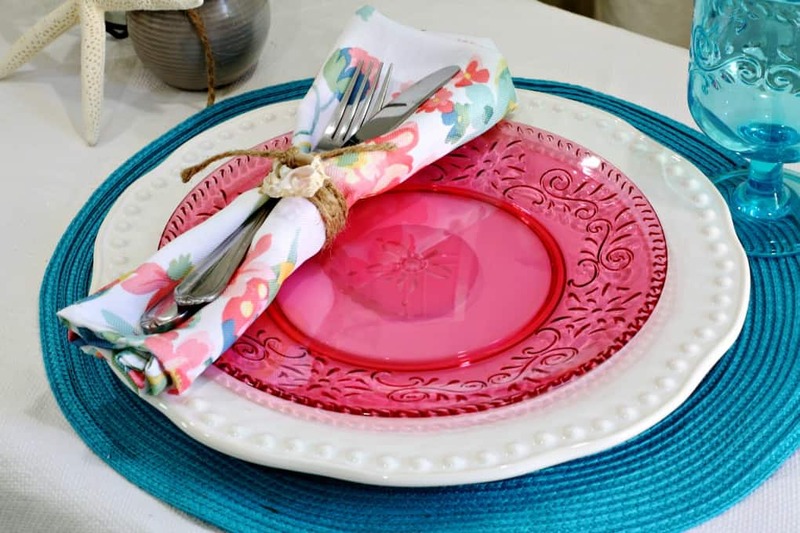 I love the idea of making a meal special with pretty tableware, even for one. It’s a great way spoil yourself just a little. Great post and photos Julie! Thanks, Michelle! 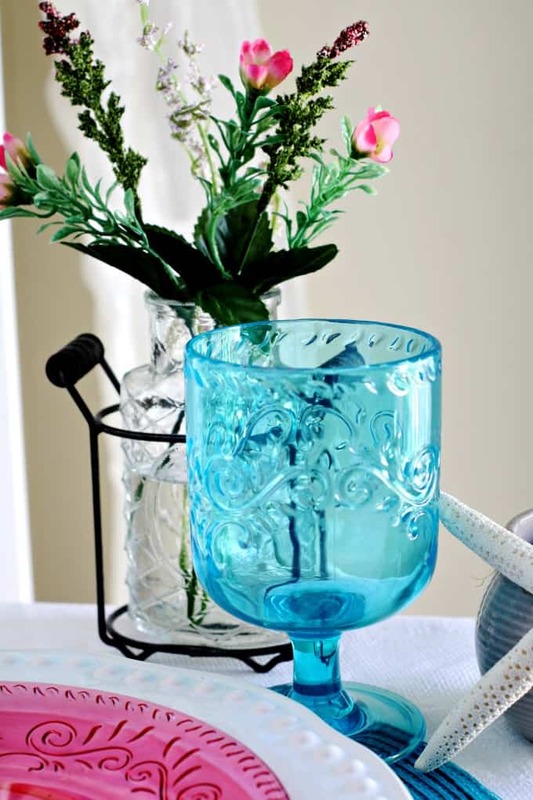 I agree… I think having pretty things for dining alone is a great way to pamper yourself! 😉 Hugs! 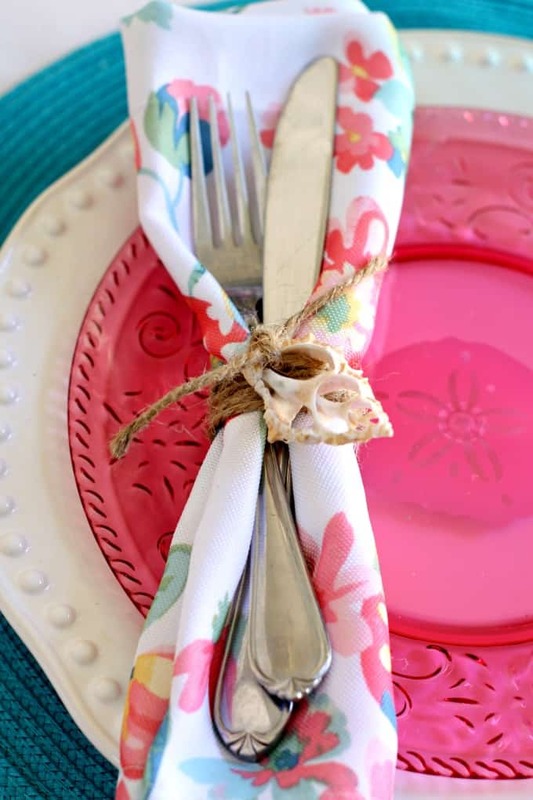 I love the idea of making our place setting look beautiful, just for us! Just because you’re eating alone doesn’t mean you’re not worth a few extra minutes to set a lovely table. As always, Julie, your photography is on point. Any chance you’re willing to come do mine?! LOL, Kim! Thank you for your kind words! My photography is probably the thing that give me the hardest time about blogging! So your words mean SO much to me! Thanks for always being an encouragement! Hugs, friend! Thanks, Stacey… I hope lots of ‘single-diners’ enjoy the series, and that others might be able find some tips, too! Definitely still learning! 😉 Hugs, sweet friend! Hey Julie! What a fun idea! 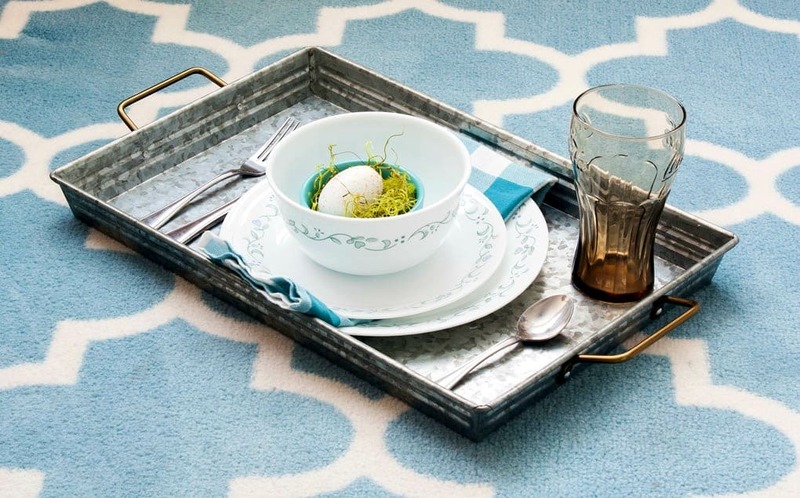 I love the idea of having a special tray to use. Sister and I often eat in front of the TV. I tray would make it more manageable for some meals!! Yes, the tray comes in SO handy! I’m glad you liked the post! Thanks for coming by! I’m so glad we got to spend a bit of time together in Charleston! Thanks for coming by, Kristi! I was hoping that this would apply to not just those of us that are single, but also those in other ‘single-dining’ situations! Wonderful! Thanks for dropping in… hope to see you more! You are a girl after my own heart! I think every meal is a chance for celebration, and your table for one is just perfect! Often when I find the opportunity to dine solo, I to set out my meal on a pretty tray and enjoy relaxing in my own company! Well, right back at ya, girlfriend! Loved your recent tablescape, as well! I’m so glad you make your solo dinners extra special! 😉 BTW, I’m featuring your tablescape on my new weekly feature, Tuesday Turn About! Hope you’ll visit (let me know if there are any issues with being featured!) Hugs, Maureen, and thanks! This is so well said! 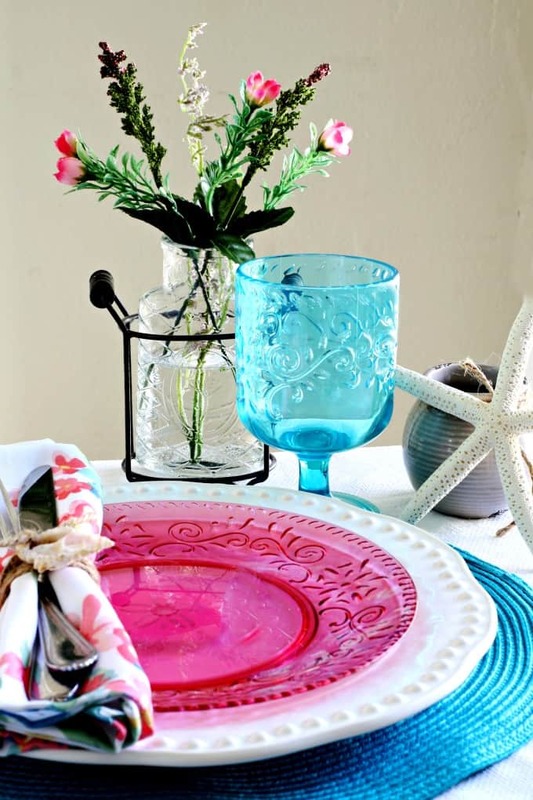 I love the pretty color scheme for your tablescape, and summery is totally a word!! Thanks, Roxanne! I’m so glad your use summery, too! 😉 So glad you dropped in! Hugs and hearts! I do find a small vase of fresh flowers adds color and just a “feel good” factor to the meal-for-one at home situation. These are such fun colors Julie. 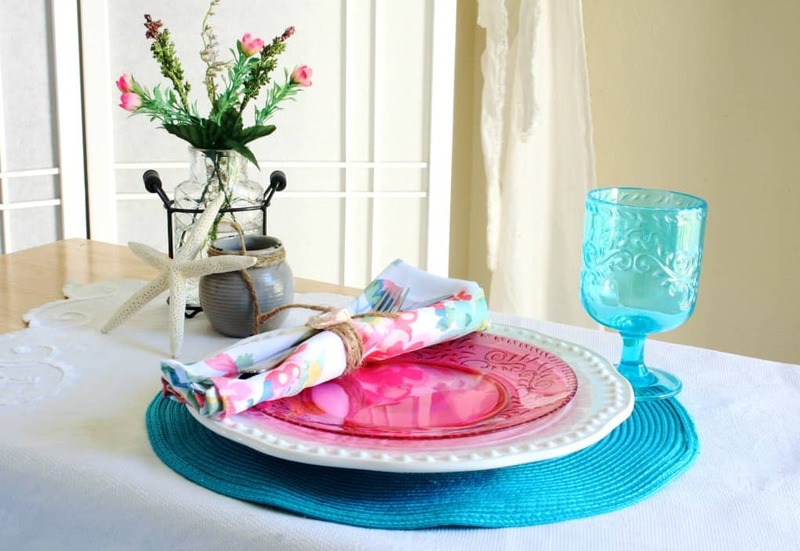 I think the small pink plate works especially well to give us that summery look! And yes it is a word! Thanks, Mary! I’m so glad everyone agrees that ‘summery’ is a word! LOL! Thanks for the love! Hugs! I am with you! It is too stinking hot to dine al fresco especially here in the south where we cornered the market on humidity! LOVE you pretty table setting for one! Setting the mood makes the meal even better! This post will be Featured at the next Merry Monday party. It was great to meet you at Haven! Oh, thank you, Shirley, for the feature! It’s always a blessing and encouragement to be featured on someone’s blog! 😉 I was just looking at your About page. I saw that your hubby’s name is Stacy… My son’s name is Stacey, though he goes by his middle name because his father is Stacey, as well as his grandfather! 😉 Don’t hear that very often! It was a pleasure to meet you, as well! Have a great weekend! Hugs! Julie, I love that you treat yourself with such style in the table for one! Beautiful table, and love that Chloe featured you on Celebrate Your Style! Kudos! 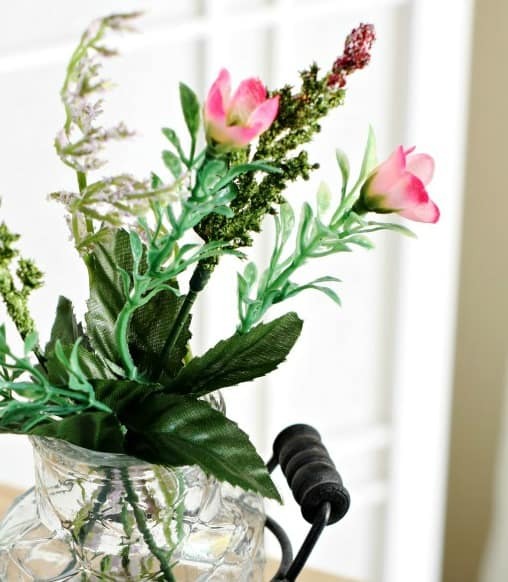 I love tablescaping, and this is very inspiring for those who live alone! Thank you so much, Rita! That is so encouraging to hear! From your sentiments, I feel like the series will be successful! Hugs and hearts! Well, thank you SO much for the encouragement and lovely comment, Kari! Haven was such a whirlwind, and SO amazing. I’m so glad we met, too… I was focused on several things during the presentations (I needed to take a video of Deb’s presentation, and then Sarah from Thrifty Decor Chicks came in and I was a bit star-struck! LOL! ), so I think I didn’t realize you were near me… so sorry! 😉 Did you know my son’s name is Stacey??? I hope you come by more often! Love getting to know new friends! Going to visit your site now! Julie, I think your first tablescape was a GREAT SUCCESS. 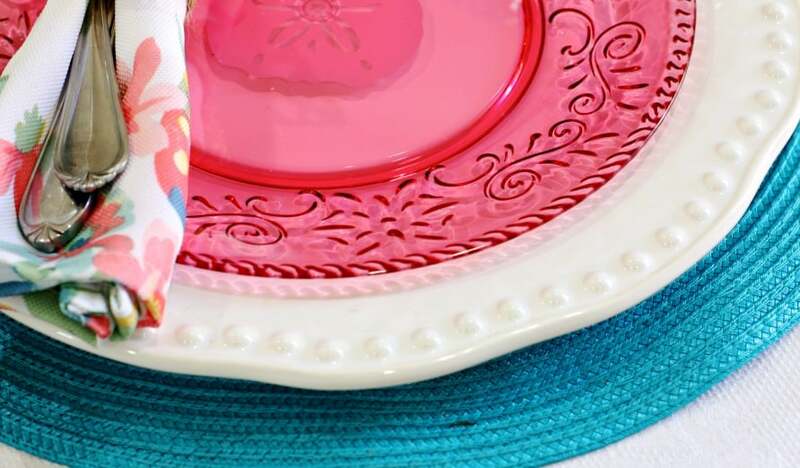 Love the beautiful colors and I’m glad that you’re treating yourself to a beautiful table. You need to just treat yourself sometimes. I’m looking forward to your new series and adventures in tiny home living. What a lovely post. I guess we don’t think of a tablescape for one unless you are in that scenario. Why not pamper yourself. I am going to remember this. I do try to use my vintage plates and cups and saucers when it is just me. Stop by Thursday Favorite Things since you are one of my features. Hi, Bev! Thank you so much for the kind words, and FEATURE! I’m thrilled! And, I think it’s wonderful that you use your vintage items when your by yourself… it feels special, doesn’t it? I’ll be stopping by, as always! Thank you, again! Thanks for the love, Amber! Totally excited to be featured twice on Thursday Fave Things! 😉 Have a great week! Thank you, Marilyn! I had actually visited before I even saw your comment here! Thank you so much for the feature, and I will return each week, to be sure! Have a great one, and thank you, again! Hugs! 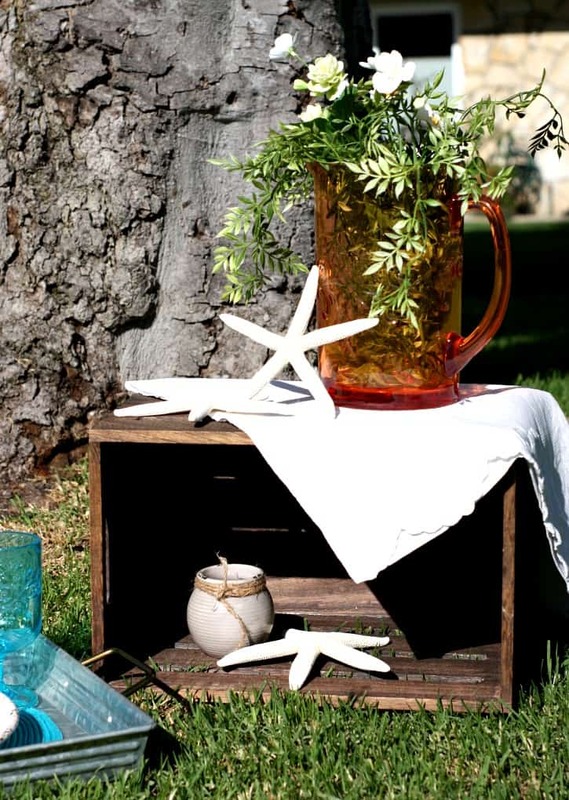 Light, fresh and romantic table setting. Very lovely thank you for sharing. Thanks for coming by, Kippi, and for the kind words! 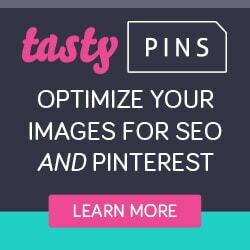 Your blog is lovely!!! Hope you have a wonderful weekend! Sooo pretty, Julie! 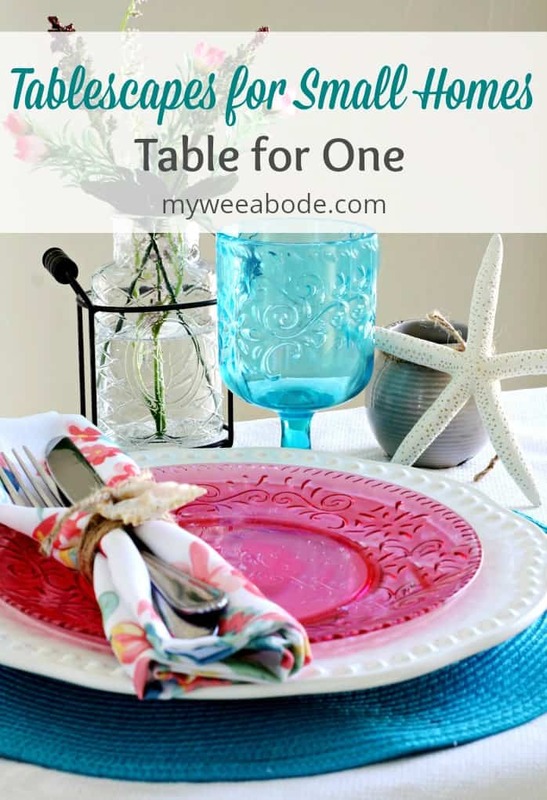 Love your new series Tablescape for One!!! I am often alone for dinner as Hubby works late every night and is often out of town on business, so it’s usually me and Mr. Yoda, our Peke. :)’ I do set up a tray once in a blue moon, but usually for breakfast. I’ll have to stop over and check out Sand Dollar Lane’s subscription boxes. Sounds fun!!! Thanks for coming by via Style Showcase, Barb… although I see you often anyways, and I’m SOOOO thankful! Treating ourselves to a little bit of pretty is something to enjoy, I think! 😉 Have a blessed weekend! Hugs! Great idea Julie. Whether by choice or circumstance, we all have to eat alone sometimes. Nice to make it pretty. Thanks, Carol! Living alone, I sometimes forget to ‘treat myself’ with a bit a pretty. 😉 But, this is easy and fun! Hope you have a great week, friend!